Not too much exciting to show you, just some progress on Olympe's creme and goldenrod stays. Both sides are fully boned, with the grommets punched into the fronts, backs, and strap attachments (also in front and back). I've begun to cover each grommet, and they are looking quite nice. I'm happy to do it this way, to cover the metal with the thread, because they come out so consistently and are also very very strong, whereas hand sewn eyelets can pull in funny ways and even tear. Next steps - finish covering eyelets, then cut and sew on the goldenrod linen binding by hand. 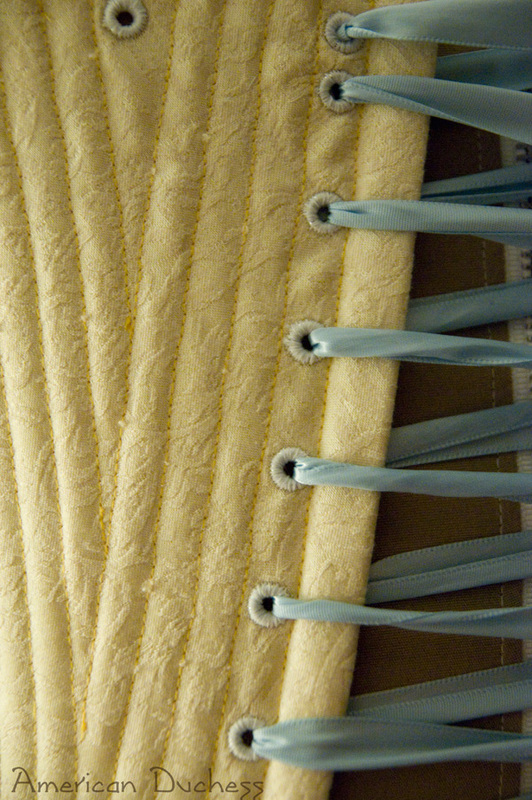 Lastly, finishing up with the straps and stomacher, and then they are done! Lovely (I knew they would be)! Very pretty! 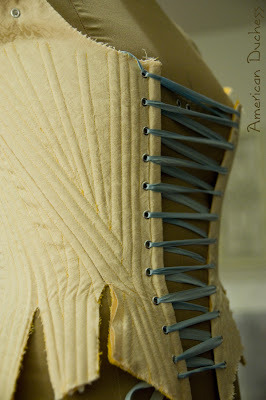 I've never had any problem with my hand sewn eyelets tearing or pulling out though. If anything, they seem stronger than grommets.